Interchanges are considered where conflicting high traffic volumes exceed those that can be handled efficiently and safely with at-grade intersections. They are also used to control access to the main highway. The location study for a proposed improvement recommends the type and location of a proposed interchange necessary to address these concerns. A precise analysis of traffic movement that justifies the necessity for an interchange is required. Depending on the complexity, appropriate modeling can include microsimulation or analysis using the Highway Capacity Manual. Access management guidelines are considered in analysis of operational and safety concerns. 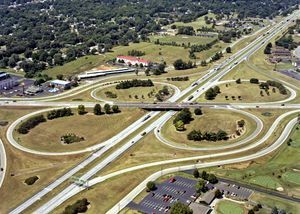 MoDOT intends to provide access for all traffic movements at an interchange on the state highway system. In some cases, traffic volumes may not warrant the provision of ramps at the time of initial construction. However, right of way should be purchased to provide for the future ramps. The plans for initial construction of the interchange will show the location of future ramps for these traffic movements. The selection of an appropriate interchange is influenced by such factors as highway classification, composition of traffic, anticipated operating speed, economics, terrain, available right of way and the degree of access control. An interchange is to be considered when warranted by the 20-year design traffic projection or safety concerns. The desired spacing between interchanges is two miles in current and projected urban areas and five miles in rural areas. Access Management Guidelines are also considered to determine the spacing of interchanges. 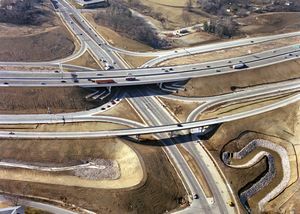 At times it may be necessary to construct a new interchange or revise an existing interchange on an interstate highway. When this occurs, access approval for new or revised access must be provided to FHWA for approval during the project development process and prior to making any changes to the interstate access. Chapter 10 of the AASHTO Green Book provides examples of these interchange types. Controlling factors in the selection of an interchange type are: right of way requirements, vehicle speed, traffic volume, terrain, access control and cost. Interchanges are designed to fit specific local conditions and meet driver expectations. Diamond interchanges are suitable in both rural and urban areas when the traffic on the minor crossroad is light to moderate. The greatest impediment to smooth operation is the volume of left-turning movements on the crossroad. 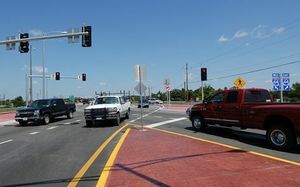 Signal operations must be considered when designing a diamond interchange. Spacing between the ramps is critical for efficient movement of traffic through the interchange. Directional interchanges accommodate high volume turning movements where two freeways intersect. Direct ramp movements reduce travel distance, increase speed and capacity, eliminate weaving and avoid the need for “out-of-direction” travel on a loop. These interchanges are costly to construct due to the increased number and length of ramps and the number of bridge crossings. Cloverleaf interchanges can be used where two high volume freeways intersect. Loop-ramps are used to accommodate left-turning movements. However, this configuration provides short weaving areas for traffic entering or leaving the interchange. A cloverleaf interchange occupies a relatively large area of right of way. 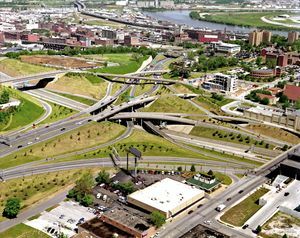 Diverging diamond interchanges (DDI) are diamond interchanges that more efficiently facilitates heavy left-turn movements. While the ramp configuration is similar to a traditional diamond interchange, traffic on the crossroad moves to the left side of the roadway for the segment between signalized ramp intersections. In some circumstances, a “basic” interchange may not be the appropriate choice to satisfy the needs of the traveling public. The interchange that is designed may be a combination of the basic types or incorporate creative modifications. A Diverging Diamond Interchange (DDI) is one example. The high cost of construction restricts the use of an interchange to those situations where the expenditure is justified. 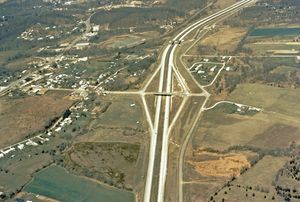 An interchange “warrants” construction based on consideration of the roadway’s design designation, traffic volume and safety of operation. This page was last modified on 27 November 2012, at 14:24.